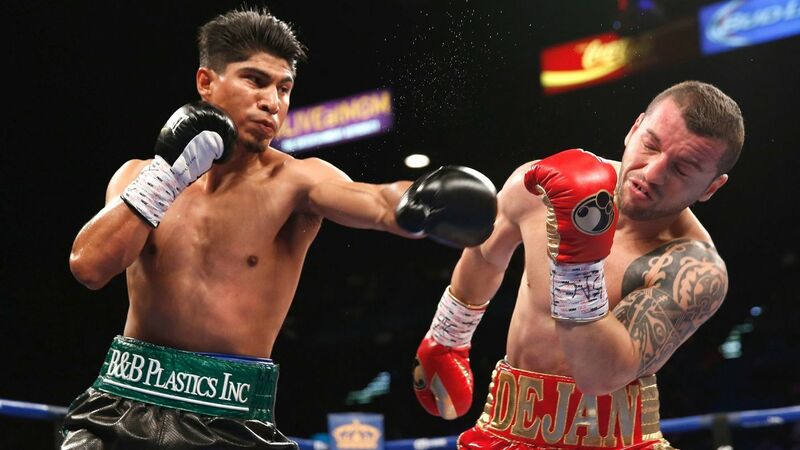 Unbeaten multi-division champion Mikey Garcia has decided to vacate his IBF junior welterweight title to return to 135-pounds, where he holds the WBC lightweight title. The unbeaten Garcia (38-0, 30 KO's), 30, of Moreno Valley, California, initially informed the IBF in a letter in late March that he would keep the title, and make a mandatory defense against challenger Ivan Baranchyk. However, Garcia changed his mind. Garcia defeated a game Sergey Lipinets in March to become a four-division world champion. Garcia won the lightweight belt in January 2017 when he scored a spectacular, one-punch knockout of Dejan Zlaticanin. Zlaticanin (23-1, 16 KO's), who had previously never been knocked down, was out cold. Then, Garcia moved up to 140 pounds the following July to square off against former four-division titlist Adrien Broner for the WBC Diamond belt, where Garcia cruised to a unanimous decision victory. Garcia has plenty of options once he returns to the lightweight division. There is the possibility of a unification bout between Garcia and Robert Easter (21-0, 14 KO's). Negotiations for a possible fight took place in late 2017, but plans fell through because of money. "He's willing to fight me, and I'm willing to fight him," Garcia told BoxingScene.com. "But when the purse was not really exciting, not what we both want, it's hard to get those fights done. And people forget, everybody wants to get paid, everyone wants to get money. No one likes to take pay cuts. "Whatever job you're doing, if the boss comes and tells you, 'I can only pay you this much because I don't have it in the budget,' I'm sure you're gonna complain about why they're cutting your money. Nobody likes to take a pay cut. So we also wanna make sure that we're being taken care of financially, as well as in boxing." Easter wound up fighting Javier Fortuna and escaped with a controversial split decision win. As long as the money is right, the fight should be easy to make, as both fighters are associated with adviser Al Haymon and Showtime. Another option would be the winner of Jorge Linares-Vasyl Lomachenko. Linares, the WBA lightweight champion, will defend his title against Lomachenko, a former two-time Olympic gold medalist, who is moving up from 130 pounds. If all else fails, Garcia can fight former Olympic gold medalist Luke Campbell. The 30-year-old Campbell (17-2, 14 KO's), of the United Kingdom, is the No. 2 ranked WBC contender, but has not fought since losing a split decision to Linares last September.